Eddie joined Watford at an early age, and made his first team debut for them at the age of 18 against Coventry City, following caps for the England U16 and U17 sides. 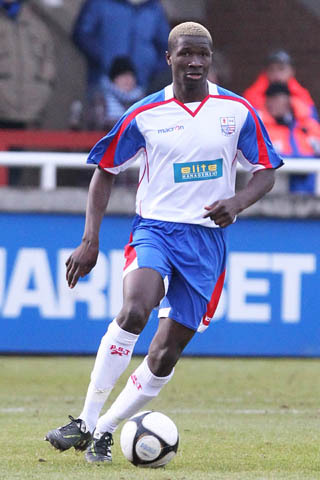 In December 2010, he had gone on a one month loan to League One side Dagenham & Redbridge but poor weather meant he only had one appearance for them. The young defender joined Diamonds on loan on 28 January 2011 for a three month period. He had played at Nene Park for the England U17 side against Portugal in August 2008. He made his debut as a substitute in the 1-1 draw against Tamworth a day later, and went on to make a further 11 starts, and scoring in front of the de Banke against Eastbourne before returning to Watford at the end of the season. He was released by Watford on 31 August 2011, and after trials at a number of clubs including Stoke City, Northampton Town and Burton Albion, he joined Conference side Forest Green Rovers on 7 October 2011. In January 2013, Eddie signed a contract extension to keep him at the New Lawn until June 2015. He left the New Lawn in February 2015, and after a short spell at Hemel Hempstead Town he joined St Albans City at the end of 2015. He moved to Wealdstone prior to the 2016-17 season, completing two seasons there before retiring from the game. His Wikipedia page is here.